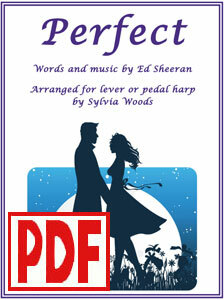 This product is a PDF download of the printed sheet music of Perfect arranged by Sylvia Woods. Ed Sheeran's Perfect has become one of the most popular wedding songs of 2018. Sylvia Woods has made a lovely six-page arrangement for advanced beginner to intermediate harp players. The music is in the key of G (1 sharp), with no lever changes within the music. The basic harp range is 3 octaves, G to G. There are also a few lower D notes that may be omitted if necessary. Lyrics, fingerings, and chord symbols are all included. AND, Sylvia is giving you an added bonus! When you're playing a wedding processional, you usually don't need to play the entire piece. Plus, you don't want to have to worry about making page turns. And so -- Sylvia is also including a shorter, two-page, one-verse version. It is exactly the same as the first 52 measures of the complete six-page version, with a short ending added. But it is re-typeset to all fit on just two pages. You get BOTH the full six-page version, and the shorter two-page version in this same PDF! Well, I found a love for me. Darling, just dive right in, follow my lead. Well, I never knew you were the someone waiting for me. Darling just kiss me slow, your heart is all I own. And in your eyes, you're holding mine. Barefoot on the grass, listening to our fav'rite song. But you heard it, darling you look perfect tonight. You can listen to Ed Sheeran's video below.